The miracle is not to walk on water. The miracle is to walk on the green earth in the present moment, to appreciate the peace and beauty that are available now. 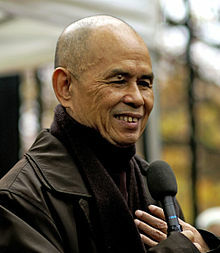 Thích Nhất Hạnh (born as Nguyễn Xuân Bảo 11 October 1926) is an expatriate Vietnamese Buddhist monk, peace activist, and prolific author in both Vietnamese and English. Nhất Hạnh is most commonly referred to as Thích Nhất Hạnh, in which the Vietnamese title Thích (釋), derived from "Thích Ca" or "Thích Già" (釋迦) and applied to all Vietnamese Buddhist monks and nuns, means "of the Shakya (Shakyamuni Buddha) clan". It's wonderful to be alive and to walk on earth. You are a miracle, and everything you touch could be a miracle. If in our daily life we can smile, if we can be peaceful and happy, not only we, but everyone will profit from it. Children understand very well that in each woman, in each man, in each child, there is capacity of waking up, of understanding, and of loving. Smiling is very important. If we are not able to smile, then the world will not have peace. Your true home is in the here and the now. It is not limited by time, space, nationality, or race. When you feel anger arising, remember to return to your breathing and follow it. The other person may see that you are practicing, and she may even apologize. Your first love has no beginning or end. Your first love is not your first love, and it is not your last. It is just love. It is one with everything. that lie deep in our consciousness. is in the way we handle this very moment. One included all, and all were contained in one. The leaf and his body were one. Neither possessed a separate permanent self. Neither could exist independently from the rest of the universe. Contemplating the bowl, it is possible to see the interdependent elements which give rise to the bowl. Freedom from suffering is a great happiness. The same clouds that Buddha had seen were in the sky. Each serene step brought to life the old path and white clouds of the Buddha. The path of Buddha was beneath his very feet. Venerable Svasti and the young buffalo boys were rivers that flowed from that source. Wherever the rivers flowed, the Buddha would be there. In order to rally people, governments need enemies. They want us to be afraid, to hate, so we will rally behind them. And if they do not have a real enemy, they will invent one in order to mobilize us. To think in terms of either pessimism or optimism oversimplifies the truth. The problem is to see reality as it is. A pessimistic attitude can never create the calm and serene smile which blossoms on the lips of Bodhisattvas and all those who obtain the way. Drink your tea slowly and reverently, as if it is the axis on which the whole earth revolves—slowly, evenly, without rushing toward the future. Live the actual moment. Only this actual moment is life. 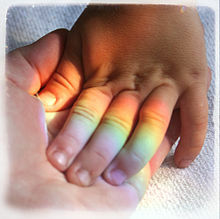 If you look deeply into the palm of your hand, you will see your parents and all generations of your ancestors. All of them are alive in this moment. Each is present in your body. You are the continuation of each of these people. Children understand very well that in each woman, in each man, in each child, there is capacity of waking up, of understanding, and of loving. Many children have told me that they cannot show me anyone who does not have this capacity. Some people allow it to develop, and some do not, but everyone has it. This capacity of waking up, of being aware of what is going on in your feelings, in your body, in your perceptions, in the world, is called Buddha nature, the capacity of understanding and loving. Smiling is very important. If we are not able to smile, then the world will not have peace. It is not by going out for a demonstration against nuclear missiles that we can bring about peace. It is with our capacity of smiling, breathing, and being peace that we can make peace. Your true home is in the here and the now. It is not limited by time, space, nationality, or race. Your true home is not an abstract idea. It is something you can touch and live in every moment. With mindfulness and concentration, the energies of the Buddha, you can find your true home in the full relaxation of your mind and body in the present moment. No one can take it away from you. Other people can occupy your country, they can even put you in prison, but they cannot take away your true home and your freedom. Love is the capacity to take care, to protect, to nourish. If you are not capable of generating that kind of energy toward yourself — if you are not capable of taking care of yourself, of nourishing yourself, of protecting yourself — it is very difficult to take care of another person. Unity and diversity interpenetrate each other freely. Unity is diversity, and diversity is unity. This is the principle of interbeing. We are like sleepwalkers, not knowing what we are doing or where we are heading. Whether we can wake up or not depends on whether we can walk mindfully on our Mother Earth. The future of all life, including our own, depends on our mindful steps. To practice mindfulness and to look deeply into the nature of things is to discover the true nature of interbeing. There we find peace and develop the strength to be in touch with everything. With this understanding, we can easily sustain the work of loving and caring for the Earth and for each other for a long time. We have to remember that our body is not limited to what lies within the boundary of our skin. Our body is much more immense. We know that if our heart stops beating, the flow of our life will stop, but we do not take the time to notice the many things outside of our bodies that are equally essential for our survival. If the ozone layer around our Earth were to disappear for even an instant, we would die. If the sun were to stop shining, the flow of our life would stop. The sun is our second heart, our heart outside of our body. It gives all life on Earth the warmth necessary for existence. Plants live thanks to the sun. Their leaves absorb the sun's energy, along with carbon dioxide from the air, to produce food for the tree, the flower, the plankton. And thanks to plants, we and other animals can live. All of us—people, animals, plants, and minerals—"consume" the sun, directly and indirectly. We cannot begin to describe all the effects of the sun, that great heart outside of our body. When we look at green vegetables, we should know that it is the sun that is green and not just the vegetables. The green color in the leaves of the vegetables is due to the presence of the sun. Without the sun, no living being could survive. Without sun, water, air, and soil, there would be no vegetables. The vegetables are the coming-together of many conditions near and far. There is no phenomenon in the universe that does not intimately concern us, from a pebble resting at the bottom of the ocean, to the movement of a galaxy millions of light years away. Walt Whitman said, "I believe a blade of grass is no less than the journey-work of the stars...." These words are not philosophy. They come from the depths of his soul. He also said, "I am large, I contain multitudes." This might be called a meditation on "interfacing endlessly interwoven." All phenomena are interdependent. When we think of a speck of dust, a flower, or a human being, our thinking cannot break loose from the idea of unity, of one, of calculation. We see a line drawn between one and many, one and not one. But if we truly realize the interdependent nature of the dust, the flower, and the human being, we see that unity cannot exist without diversity. Unity and diversity interpenetrate each other freely. Unity is diversity, and diversity is unity. This is the principle of interbeing. If you are a mountain climber or someone who enjoys the countryside or the forest, you know that forests are our lungs outside of our bodies. Yet we have been acting in a way that has allowed millions of square miles of land to be deforested, and we have also destroyed the air, the rivers, and parts of the ozone layer. We are imprisoned in our small selves, thinking only of some comfortable conditions for this small self, while we destroy our large self. If we want to change the situation, we must begin by being our true selves. To be our true selves means we have to be the forest, the river, and the ozone layer. If we visualize ourselves as the forest, we will experience the hopes and fears of the trees. If we don't do this, the forests will die, and we will lose our chance for peace. When we understand that we inter-are with the trees, we will know that it is up to us to make an effort to keep the trees alive. We should bow deeply before the orchid and the snail and join our palms reverently before the monarch butterfly and the magnolia tree. The feeling of respect for all species will help us recognize the noblest nature in ourselves. All life is impermanent. We are all children of the Earth, and, at some time, she will take us back to herself again. We are continually arising from Mother Earth, being nurtured by her, and then returning to her. Like us, plants are born, live for a period of time, and then return to the Earth. When they decompose, they fertilize our gardens. Living vegetables and decomposing vegetables are part of the same reality. Without one, the other cannot be. After six months, compost becomes fresh vegetables again. Plants and the Earth rely on each other. Whether the Earth is fresh, beautiful, and green, or arid and parched depends on the plants. It also depends on us. Our way of walking on the Earth has a great influence on animals and plants. We have killed so many animals and plants and destroyed their environments. Many are now extinct. In turn, our environment is now harming us. We are like sleepwalkers, not knowing what we are doing or where we are heading. Whether we can wake up or not depends on whether we can walk mindfully on our Mother Earth. The future of all life, including our own, depends on our mindful steps. Birds' songs express joy, beauty, and purity, and evoke in us vitality and love. So many beings in the universe love us unconditionally. The trees, the water, and the air don't ask anything of us; they just love us. Even though we need this kind of love, we continue to destroy them. By destroying the animals, the air, and the trees, we are destroying ourselves. We must learn to practice unconditional love for all beings so that the animals, the air, the trees, and the minerals can continue to be themselves. Our ecology should be a deep ecology—not only deep, but universal. There is pollution in our consciousness. Television, films, and newspapers are forms of pollution for us and our children. They sow seeds of violence and anxiety in us and pollute our consciousness, just as we destroy our environment by farming with chemicals, clear-cutting the trees, and polluting the water. We need to protect the ecology of the Earth and the ecology of the mind, or this kind of violence and recklessness will spill over into even more areas of life. Our Earth, our green beautiful Earth is in danger, and all of us know it. Yet we act as if our daily lives have nothing to do with the situation of the world. If the Earth were your body, you would be able to feel many areas where she is suffering. Many people are aware of the world's suffering, and their hearts are filled with compassion. They know what needs to be done, and they engage in political, social, and environmental work to try to change things. But after a period of intense involvement, they become discouraged, because they lack the strength needed to sustain a life of action. Real strength is not in power, money, or weapons, but in deep, inner peace. If we change our daily lives—the way we think, speak, and act—we change the world. The best way to take care of the environment is to take care of the environmentalist. Self, person, living being, and life span are four notions that prevent us from seeing reality. Life is one. We do not need to slice it into pieces and call this or that piece a "self." What we call a self is made only of non-self elements. 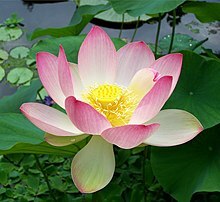 When we look at a flower, for example, we may think that it is different from "non-flower" things. But when we look more deeply, we see that everything in the cosmos is in that flower. Without all of the non-flower elements — sunshine, clouds, earth, minerals, heat, rivers, and consciousness — a flower cannot be. That is why the Buddha teaches that the self does not exist. We have to discard all distinctions between self and non-self. We think that we have been alive since a certain point in time and that prior to that moment, our life did not exist. This distinction between life and non-life is not correct. Life is made of death, and death is made of life. We have to accept death; it makes life possible. The cells in our body are dying every day, but we never think to organize funerals for them. The death of one cell allows for the birth of another. Life and death are two aspects of the same reality. We must learn to die peacefully so that others may live. This deep meditation brings forth non-fear, non-anger, and non-despair, the strengths we need for our work. With non-fear, even when we see that a problem is huge, we will not burn out. We will know how to make small, steady steps. If those who work to protect the environment contemplate these four notions, they will know how to be and how to act. The tenth penetration is, "All times penetrate one time. One time penetrates all times — past, present, and future. In one second, you can find the past, present, and future." In the past, you can see the present and the future. In the present, you can find the past and future. In the future, you can find the past and present. They "inter-contain" each other. Space contains time, time contains space. In the teaching of interpenetration, one determines the other, the other determines this one. When we realize our nature of interbeing, we will stop blaming and killing, because we know that we inter-are. Interpenetration is an important teaching, but it still suggests that things outside of one another penetrate into each other. Interbeing is a step forward. We are already inside, so we don't have to enter. In contemporary nuclear physics, people talk about implicit order and explicit order. In the explicit order, things exist outside of each other — the table outside of the flower, the sunshine outside of the cypress tree. In the implicit order, we see that they are inside each other — the sunshine inside the cypress tree. Interbeing is the implicit order. To practice mindfulness and to look deeply into the nature of things is to discover the true nature of interbeing. There we find peace and develop the strength to be in touch with everything. With this understanding, we can easily sustain the work of loving and caring for the Earth and for each other for a long time. His ideas for peace, if applied, would build a monument to ecumenism, to world brotherhood, to humanity. ~ Martin Luther King Jr. He has immense presence and both personal and Buddhist authority. If there is a candidate for "Living Buddha" on earth today, it is Thich Nhat Hanh. He oversees several retreat centers in America and Europe where his disciples engage in the practice of a "New Age"-style Zen and rituals created by him that do not have any affinity with or any foundation in traditional Vietnamese Buddhist practices. A great spiritual leader whose influence can help us find a living peace in everything we do. Thich Nhat Hanh's words connect inner peace with the need for peace in the world in a compelling way. [Thich Nhat Hanh] shows us the connection between personal inner peace and peace on earth. Thich Nhat Hanh is a real poet. Thich Nhat Hanh writes with the voice of the Buddha. Thích Nhất Hạnh is an influential religious innovator, who has actively adapted and transformed Buddhist ideas and practices to make them more suitable for Western religious markets. He has succeeded admirably: he is undoubtably one of the best-known and most popular Buddhist leaders in the world today, and his notion of "mindfulness" has spread far beyond the limits of religion proper, to the point it has become a buzzword used regularly in lifestyle magazines and management courses. … Nevertheless, the statement that Thích Nhất Hạnh's ideas "do not have any affinity with or any foundation in traditional Vietnamese Buddhist practices" is arguably too simplistic. In particular, his notion of "engaged Buddhism" … reflects a longer tradition of Buddhist social and political activism, in Vietnam and elsewhere in Asia. This would be a notably auspicious year for you to bestow your Prize on the Venerable Nhat Hanh. 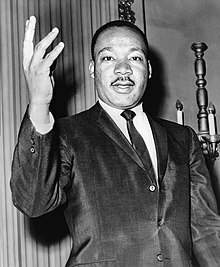 Here is an apostle of peace and non-violence, cruelly separated from his own people while they are oppressed by a vicious war which has grown to threaten the sanity and security of the entire world. Thich Nhat Hanh offers a way out of this nightmare, a solution acceptable to rational leaders. He has traveled the world, counseling statesmen, religious leaders, scholars and writers, and enlisting their support. His ideas for peace, if applied, would build a monument to ecumenism, to world brotherhood, to humanity. This page was last edited on 12 March 2018, at 14:06.